"The quiet rising of the sun casts rainbows of soft color onto the waters and skies and a rolling breaker in the 'island seas'!" Artist comment: "My first visit to the Hawai'ian Islands was almost an overload of beautiful scenes to capture in my memory. From wonderfully hospitable people to the pristine beaches and swaying palm trees, I took it in. (And that was only one of The Islands, O'ahu). The clouds and water are softly tinted with rainbow colors as the afternoons shift toward sunset. When sudden showers pass, the ocean is lit up with the reflection of the shimmering atmosphere. My first paintings, when I returned to reality, were the waves and clouds and skies of that corner of Heaven. This medium sized oil on canvas is one of a series of those delicate scenes. Since there are no offshore rocks, I was able to keep the mood light, and use the depth of the rolling wave as a counterpoint to the pastel colors in the sky and ocean." 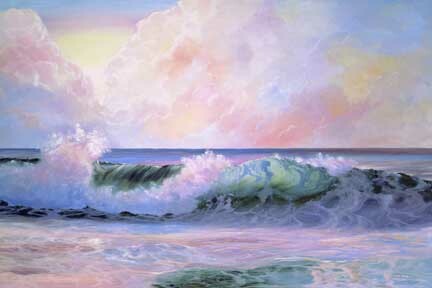 "Island Seas" is a limited edition, giclée print from an original pastel painting by Carol Thompson. The edition includes 3600 authorized, signed, limited edition prints (3500 numbered and 100 artist proofs). Release date is August 2002. Image size and substrates vary. All prints are signed and numbered by the artist and include a certificate of authenticity. Paper prints are shrink wrapped on foam board. Canvas prints are coated with a protective spray.